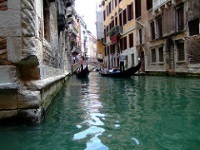 Mention Venice and the image of beautifully-lit canals and graceful gondoliers come to mind. This romantic city does, however, boast many more excellent tourist attractions. The Grand Canal (Canalazzo), Venice's main waterway, divides the city with sestieri to the west and east of it. It is the core around which much of the activity in Venice is conducted, surrounded by the elegant facades of the palazzi. A 'must-see' is St Mark's Square (Piazza San Marco), in the heart of Venice. Basilica dei Frari, a Gothic Franciscan church, was constructed in the 14th century and is mostly known for being the gravesite of Titian and the Venetian sculptor, Antonio Canova. Explore the School of St Roch or the Gallerie dell'Academia, which houses one of Europe's finest art collections from the 14th to 18th centuries. Visit the historic La Fenice Theater or the Jewish Ghetto of Venice, where the word 'ghetto' derives from. Life is still very active in the ghetto, home to five synagogues, as well as various shops and restaurants. The traditional mode of transport in Venice is by foot or boat, so enjoy the strolls and relaxed boat trips. All visitors to Venice should buy a Venice Card, as it gives you use of the main tourist services, including optional discounted airport transfers, vaporetto services and admission to some museums and attractions.